Dogs are naturally playful creatures and love to explore the outdoors. However, their adorable inquisitiveness makes them susceptible to a host of harmful fungal and bacterial skin infections. Resulting diseases, such a dog hot spots, need to be accurately diagnosed and properly treated in time to prevent the condition from spreading and turning fatal. Relying on natural treatment options, instead of conventional medicines, ensures that your pet overcomes dog hot spot pain quicker, and without any side effects of harsh pharmaceutical drugs. Hot spots on dogs is a common disease that dogs suffer from. Hot spots are also known as pyotraumatic or moist dermatitis. These sports are red, and in the form of moist scabs or lesions. They are warm to the touch and typically develop near the head, buttock and chest regions of dogs. The infected area tends to rapidly lose fur and ooze hot, sticky fluids. 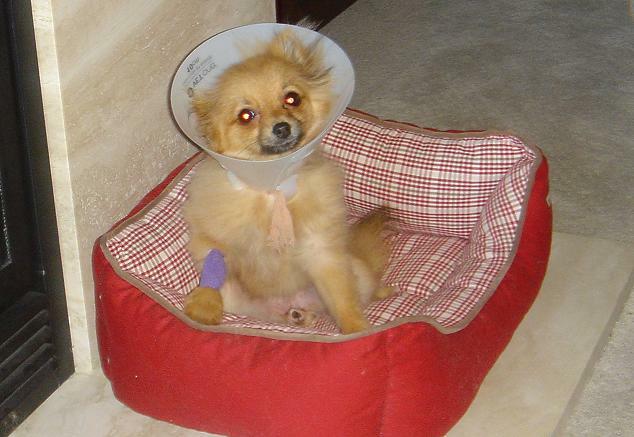 The condition is very painful for the dog, and hence, requires urgent attention. 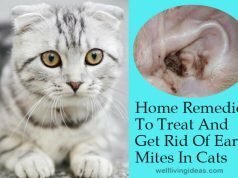 Seemingly harmless factors such as allergies to trees and shrubs, food allergies, and fleas can lead to the development of hot spots, as can mites and ticks, insect bites and open wounds. Because hot spots are itchy and painful, your dog might chew or scratch the infected area, which might make the infection severe. How to keep away dog licking hot spots? If you feel that your dog has contracted hot spots, take him to the vet right away! Usually, an Elizabethan collar or a doggy cone is prescribed to keep him from being able to reach the spots. Applying a soothing preparation like lavender oil or diluted ACV can help alleviate the pain. 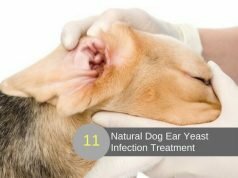 You will find below a list containing the 15 best natural options on how to treat your dog’s hot spots, and how to prepare them at home. Tea is not just good for your body, but also for your dog’s. While there are different kinds of teas available on the market, green tea or black tea are generally preferred. The two have remarkable antimicrobial properties. The latter is renowned for its soothing effects that can help ease the irritation in the infected region. Steep the tea bag in hot water for a couple of minutes and then let it cool to a temperature that can be comfortably tolerated by your pet. Place the tea bag on the spots or simply dab the region gently, without rubbing against it. The Belladonna plant, also known as “deadly nightshade”, is one of the most potent acute moist dermatitis cure options available. It is largely used in homeopathic medicine. Place the herb in a pan of water and let it heat. Once the water begins to boil, take the pan off the stove and let the Belladonna rest in the water. Once the water has cooled down to a comfortable lukewarm temperature, use a dropper to administer it on the infected area and massage it gently onto the area with clean fingertips. Remember how you used tea tree oil to clear that random bout of acne overnight? Well, it is just as effective on your doggy’s skin. Mix a tablespoon of tea tree oil with half a teaspoon of water. Apply the diluted mixture directly on the spots using a dropper. Lavender oil can also go a long way in providing relief to your dog. You can dip a cotton ball in the oil and use it to massage it into the skin. These oils are completely organic so it will not be a problem even if your dog licks the area after application. Salt has been used since times immemorial as a natural cleanser and treatment for wounds, infections, fungal patches and the like. Preparing a salt water solution is perhaps the easiest and the most effective remedy for treating a heat spot. Simply spritz the solution onto the area using a spray bottle and repeat it a couple times a day. However, make sure that you also clean the area at least once a day. The salt kills the germs and prevents the condition from spreading any further. It also discourages your dog from licking the area due to the salty aftertaste. Considered to be nature’s strongest astringent, witch hazel has excellent cleansing as well as healing properties. More importantly, the herb gets the job done in an extremely gentle way so as not to dry out or adversely affect your pup’s skin or fur. Prepare an essence of the herb by placing it in boiling water and then letting it sit for a few minutes until it acquires a lukewarm temperature. Then dab it onto the infected area using a few clean cotton balls. The spots should start to clear by the end of a week. That aloe helps heal a host of skin irritations (1) is a fact well-known. It cools the infected region while at the same time working its magic to heal the condition by virtue of it being a natural antiseptic. The extracts of the aloe plant serve as a cost-effective remedy that can be prepared very easily. Take a freshly-cut aloe leaf and scoop out the gel. You can make the gel a bit more viscous if you would like to by adding a tablespoon of shea butter to it. Apply it on the lesions twice daily, preferably once after giving him a bath and once at night. An integral part of treating hot spots is keeping them as dry as possible. This prevents the already infected area from becoming a favorable breeding ground for germs and fungi. It also kills the existing germs and helps heal the skin faster. Corn starch does exactly that by sucking out the fluids from the infected lesion. Just apply some vinegar or steeped teabags on the spots and then sprinkle a pinch of corn starch over it. However, if you are using vinegar, do make sure that you use just a wee bit otherwise it may start to sting. If you are on a tight budget and have a busy schedule, then coconut oil is the ideal remedy for you to resort to. Virgin coconut oil is widely available and it is 100% safe to use. Cold-pressed oils are preferred, because they are able to retain more of the nutrients than their counterparts. It is an excellent source of saturated fats (which are antiseptic and, thus, a bane for hot spots)(3). It can be applied directly by massaging it onto the site of infection using a cotton ball at least twice a day. 9. Honey – it shrunk the hot spots! There is no better way to get rid of your dog’s hot spots, or any skin infection for that matter, than organic honey. Being a viscous liquid with superb antimicrobial characteristics (2), it helps soothe the skin and stays on the site of application without running. 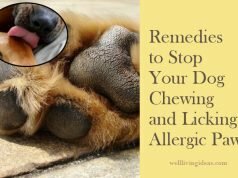 Just make sure that your dog does not get a taste of the medicine because the sweet taste will get him addicted to it, which means that he will not be able to resist licking it off. Apply it directly on the spots in liberal quantities as many times a day as required. When all else fails, good old water saves the day. If you want to learn how to clean the infection while at the same time treating it, all you need is a clean cotton piece of cloth and a few cubes of ice. First, dip the cloth in ice water and wring it gently. The wetting of the cloth helps prevent skin-to-cloth friction, which aggravates the spots. Wrap a few cubes of ice with the wet cloth and dab it on the spots. The coldness of the ice will combat the uncomfortable itchy warmth of the infection on the skin. The Indian lilac, commonly referred to as Neem, has been in use as a wonder herb for treating skin infections of all kinds for centuries in the Indian subcontinent. Many organic anti-acne and anti-pimple creams and washes also list it as an active ingredient. This is because it has a strong effect on germs and helps the skin become irritant-free. Grind a few Neem leaves, adding a few drops of water in the process, to make a paste. Apply it liberally on the hot spots and observe a noticeable difference since day one! Applying it once a day after giving your dog a bath should suffice. Shampoos that are made specifically for babies are also gentle enough for your dog. If they do not contain sulfates or parabens of any kind (which is why you should always check the ingredient label on shampoo bottles), they are completely safe to use. Washing with a mild shampoo once every other day is recommended to help purify the infected area of germs. Some baby shampoos even contain added beneficial ingredients like aloe or Vitamin E. Dip a cotton ball in the shampoo and use it to massage it into the skin. It will prove to be an excellent medicine for canine hot spot. A cup of organic yogurt is packed with fats, proteins and other essential nutrients and also has a cooling effect. This is why it is often recommended to be incorporated into your daily diet as well as that of your pet. Its application on hot spots has proven to yield miraculous results, even triumphing over conventional prescription medicines in certain cases. Its power gets multiplied once a Vitamin E capsule is emptied into it. Mix the vitamin thoroughly and apply it onto your dog’s skin, making sure to massage it well so that it gets absorbed faster into the skin. Apple cider vinegar has been in the news of late and is being hailed as the miracle answer to most medical problems – obesity, low blood pressure, loss of appetite, acne, and others. However, a lesser known fact is that it is equally beneficial for your dog. Diluted apple cider vinegar can be used to treat hot spots through ACV baths, sprays or simply massaging it on the affected area. Make sure to pay extra attention to his paws and apply the ACV liberally on them because the membrane between the paws is prone to infection and stays mostly hidden from your view. The ultimate treatment option on our list is one that is typically used to wash koalas and grizzly bears: a eucalyptus leaf bath. However, it has proven to yield excellent results while treating dogs and other animals, who have been affected by skin problems, equally well. All you need is to boil a bunch of eucalyptus leaves in a tub and let it cool to a lukewarm temperature before letting your dog in. In case you are unable to procure the leaves, you can simply add a little bit of eucalyptus essential oil to the water for the same impact. Make sure that you administer the remedy regularly and that you prepare the treatment carefully. 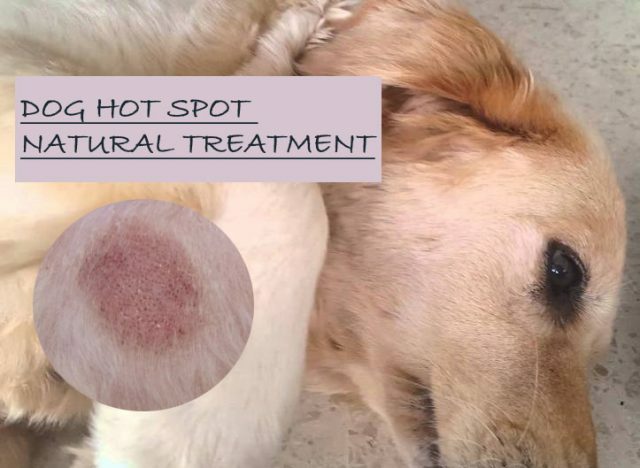 On the other hand, do not keep your dog from the clinic, despite opting for natural hot spot treatment options, because it is of paramount importance that the cause of the infection be detected and removed from his surroundings. Let your pup play to his heart’s content! All you need to do is keep him clean and cool to prevent germs from accumulating on his skin or fur coat. What To Do If a Tick Bites Your Dog?